Sasha Regan has been director of the Union Theatre in London for 19 years. It is a small space, seating about 60, and usually operates on a profit share basis, as most of London’s fringe theatres do. Over the years, the Union Theatre has won many awards for its innovative work. 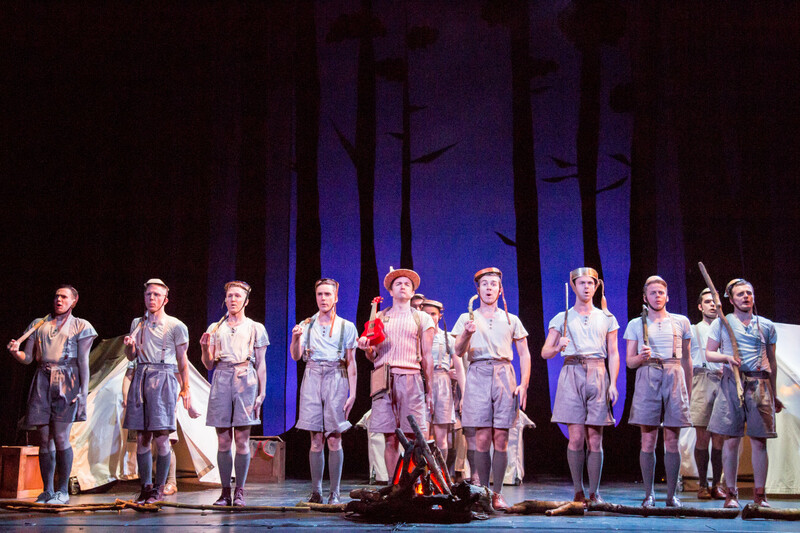 This all-male production of The Mikado was first seen there earlier in 2017, and has since toured various venues in England. Sitting opposite the mock-Indian domes of the Royal Pavilion in Brighton is the Theatre Royal, opened in 1807 and one of Britain’s oldest, and certainly best-loved theatres. This is where I got to see the production. Well into the 1960’s, when Gilbert & Sullivan and D’Oyly Carte were still probably the most popular form of stage musical entertainment in the UK, many British Boys’ Grammar and Public Schools would stage an annual production of one of the comic operas, using boys with unbroken voices for all the female roles, and boys with broken voices, plus members of the teaching staff, in the male roles. 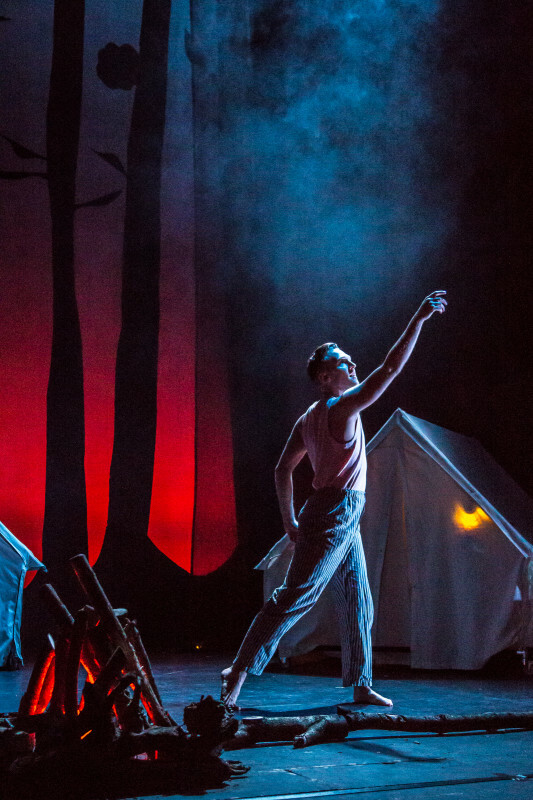 This attempts to explain why Sasha Regan sets her production in a 1950s school camping trip, complete with three tents on stage and a backdrop of tree silhouettes (stage design: Ryan Dawson Laight). The cast of 16 nearly all wear long shorts – those playing females have the bottom of their shorts rolled up – and school shirts, so that identification of the different characters takes some time! David McKechnie is Ko-Ko, the cheap tailor elevated to the post of Lord High Executioner. He has a light comic touch, evident especially in Act One where his rewritten “Little List” is the most amusing moment of the show. In Act Two, the scene in which he tries to woo Katisha is too prolonged and self-indulgent. In fact the end of Act Two loses momentum and, instead of being the climax of the operetta, is pulled out so that some of the audience at Brighton clearly wondered if it was ever going to end – and left! Katisha, one of Gilbert’s famous ‘old ladies,’ would often have been played by the Matron (in charge of the sanatorium) at a UK Boarding School, the only female member of the cast! Here, Alex Weatherhill does a fine job in his two solos, revealing not only a superb alto voice, but also a true sense of the style required for G&S. 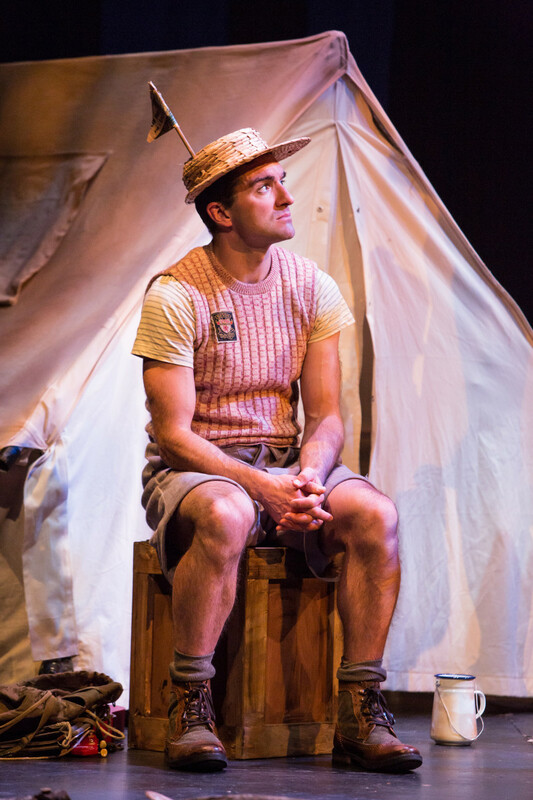 Ross Finnie in a Tartan waistcoat as Pooh Bah is not given the opportunity to make the role as dominant as it should be, the same going for Nanki-Poo (Richard Munday) whose tenor voice sounds strained in his opening number (“A Wandering Minstrel, I”). 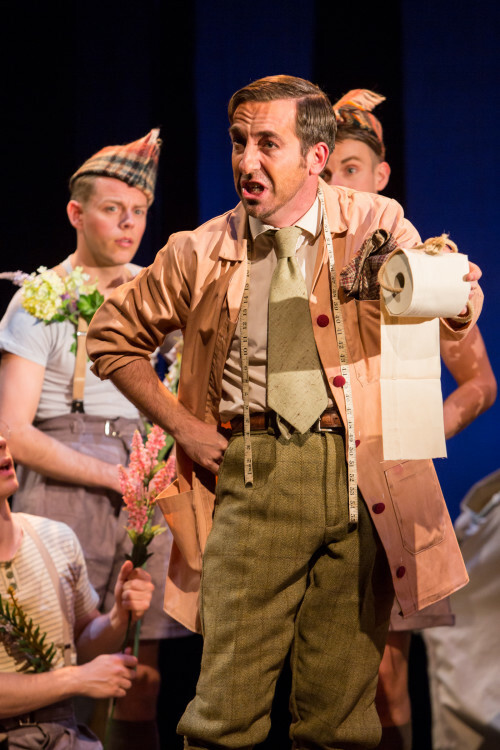 James Waud in the title role takes the Mikado’s song faster than usual which means that it lacks authority. 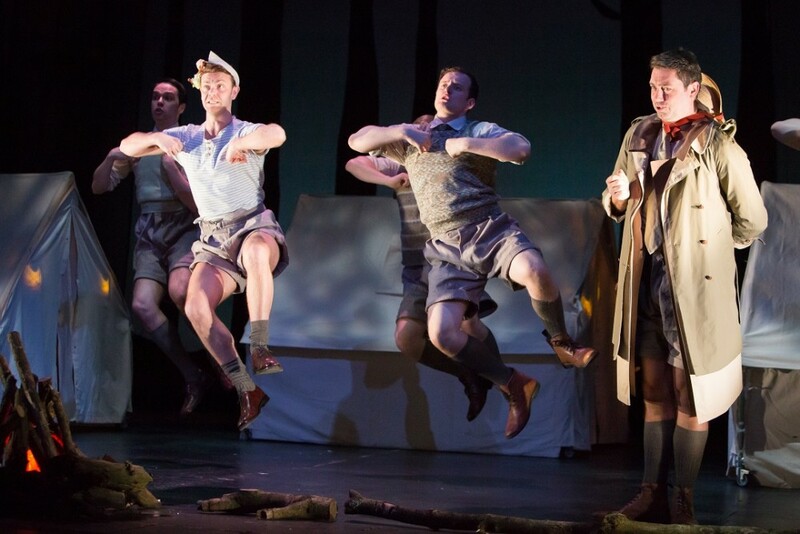 The remainder of the company dance and sing with gusto(choreography: Holly Hughes), though seemingly ignoring the fact that they are supposed to be schoolboys of 13 – 16! Miss Regan’s production is performed without alteration to lyrics or dialogue, which often seems decidedly odd – or ‘Gilbertian’! 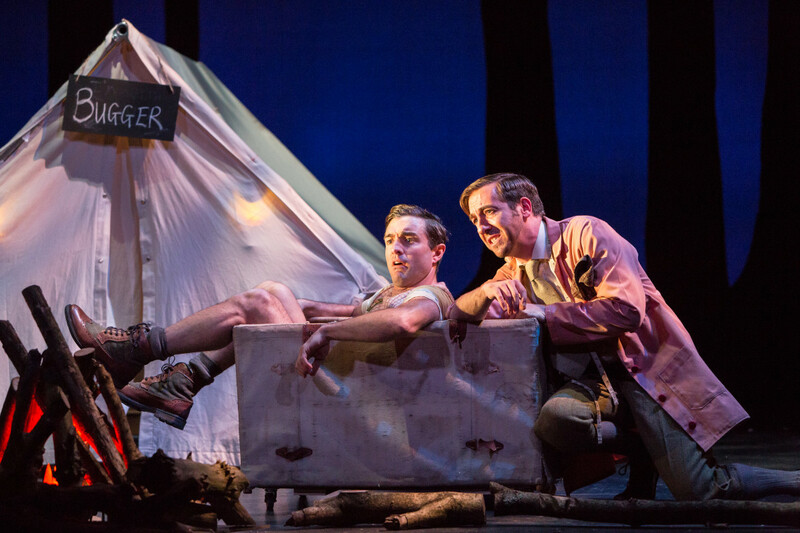 – given that the opera is set in Japan, yet the set is three tents in an English woodland! Anyone coming to the opera for the first time would, I think, fail to understand what was going on, especially as the program includes detailed notes on the history of The Mikado plus another on the rise of comic opera, yet fails to give any hint of the raison d’être for this particular all-male staging! The result is much less amusing than I was expecting: there were very few laughs from the audience throughout the piece, often because lines were not delivered with clarity. The Musical Director is Richard Baker. He has the unenviable task of making a very tinny sounding electric piano played from the orchestra pit fill a 952 seat theatre! It doesn’t! Perhaps it would have been better to have had him onstage as part of the action, or, as in many small-scale musical productions, the cast could also have played instruments in role? Ten years ago, fringe theatres produced musicals only using piano accompaniment, but today a small orchestra is nearly always used, e.g. at the Southwark Playhouse a few yards from Miss Regan’s own Union Theatre, where this production started life. To just use one piano in a large theatre is not acceptable! The burning basic question I am left with is: why? 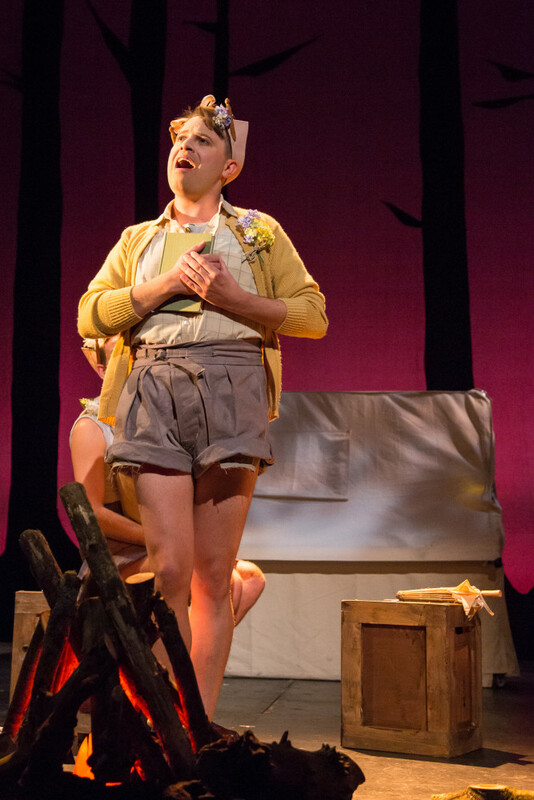 Why relocate The Mikado to a 1950s school camping trip? Why use an all-male cast? I am all for looking at new ways of staging well-known works, such as Barrie Kosky does at Komische Oper Berlin, especially when that reveals new depths or humor. But in this case I felt that the production did a disservice to its material. By the way, the average age of the audience was about 75. I felt quite youthful amongst them!